Today’s post is super exciting because I’m partnering up with the beautiful Elle Spann from Southern Elle Style. Not only am I an avid reader of her blog, but she is so incredibly charming and a genuinely lovely person. She blogs about everything: lots of fashion, bits of beauty and activewear and she incorporates a lot of lifestyle too (she recently got engaged!) What I really like about her is the honesty, wit and humor in all of her posts. She’s clear when she likes features about clothing and it’s an honest point of view from someone who knows a lot about fashion and clothing. Honestly, she can make any piece look so incredible and I value her expertise for that because I can barely dress myself. Her story telling within posts is so fun to read too and really gives her readers a window into her real world. Make sure to give her blog southernellestyle.com a read because I know you will fall in love with her just as much as I have! Now to the lipstick options for this mushy gushy holiday, I wanted to bring out the best of the best for this round up. In case you’re new around these parts, I have hundreds of lipsticks (no, really.) 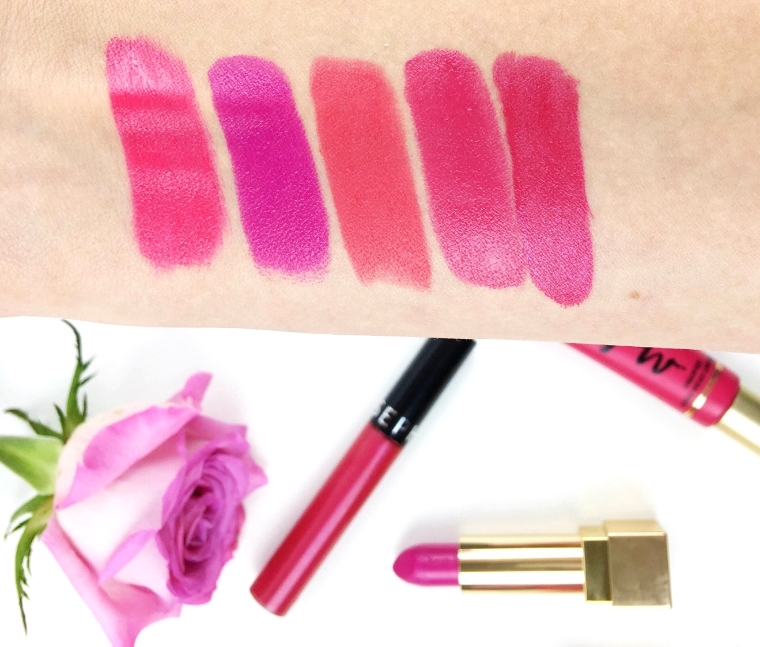 Coincidentally all of my Valentine’s Day picks landed in the high-end spectrum (apologies if you’re looking for drugstore) but I did notice I mainly use high-end lipsticks and it’s not intentional by any means. Just worked out that way. Now enough jibber jabber, let’s do this! 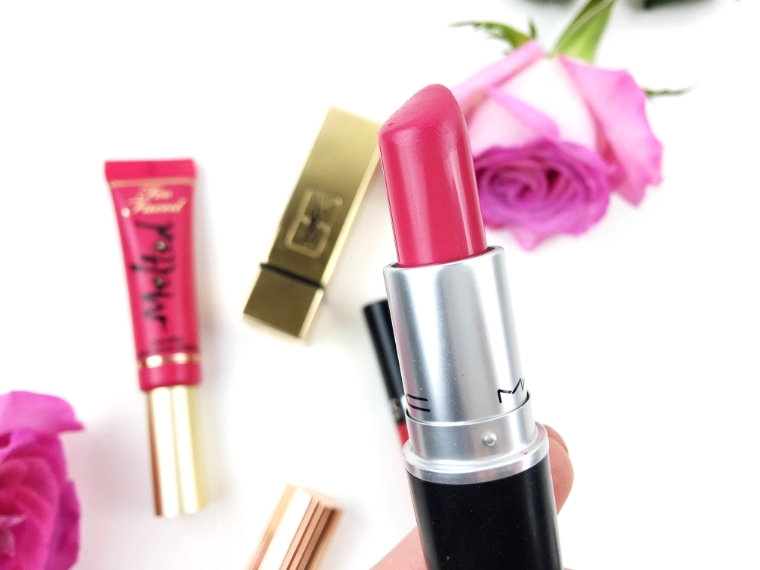 We are going to start off with MAC’s Diva-ish which is a vibrant pink shade. 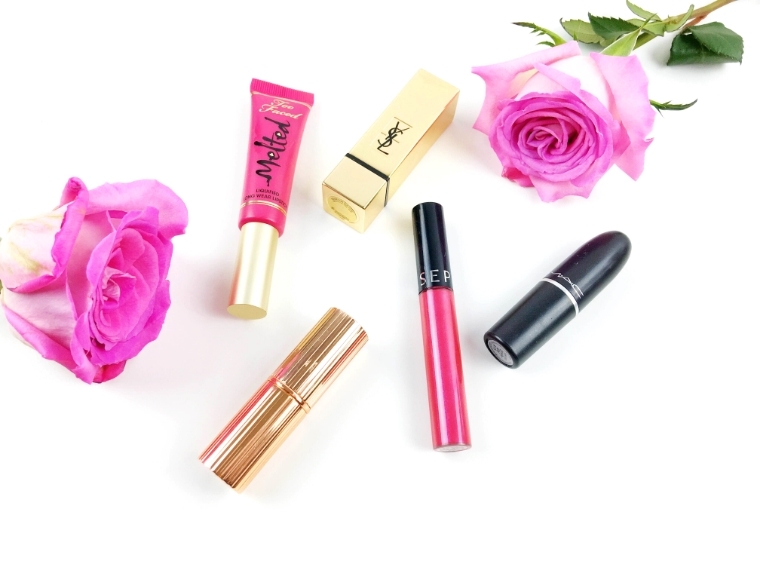 Incredibly matte, yet moisturizing, it’s a win win for those who want to have a beautiful pop of pink color on their lips. This is a high-pigmented pink shade that is the stereotypical “Barbie pink” and I love the shade for this reason. 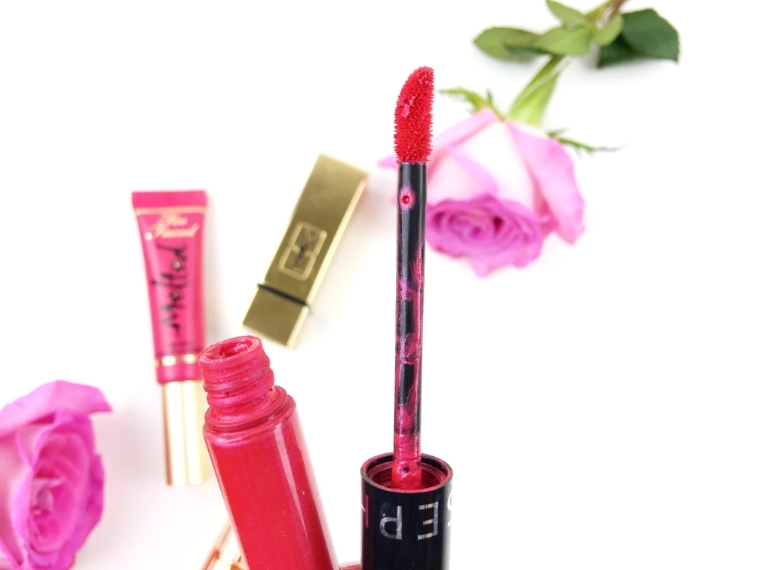 It’s fun, girly and looks so nice as I’ve found this shade makes my lips look plumper and of course, like all MAC lipsticks, it has that intoxicating smell that makes me want to reapply multiple times throughout the day…or is that just me? 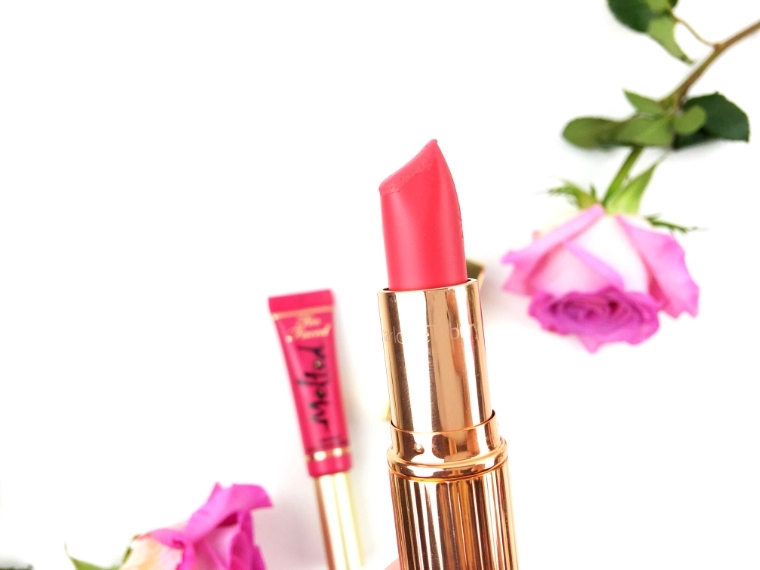 Charlotte Tilbury’s Lost Cherry is part of their Matte Revolution lipstick line and it is the most beautiful in between red and pink shade. It’s not quite red, yet it’s not quite pink. Just the right combination and I love the in-between. I was quite turned off from Charlotte Tilbury lipsticks when I first tried the regular line, but then I tried a few from of the mattes and I was a complete convert. They wear comfortably throughout the day and fade naturally so the color slowly wears off and looks like a stain. You know this wouldn’t be a proper lip post without mention of Too Faced’s Melted liquid lipsticks. The shade ‘Melted Candy’ borders neon pink, but not quite that intense. If you’re looking to make a statement, this is the shade (even more so than Diva-Ish.) 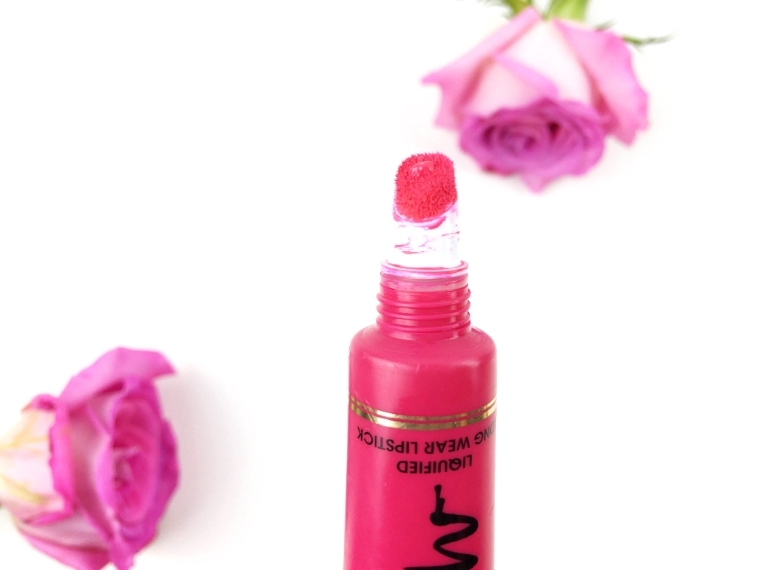 This can be a bit drying so it would be ideal to apply some lip balm after applying this color; that will give the look a more shiny, plumping touch. In terms of colors, I would say the Too Faced, MAC and Sephora are really close with the difference being the vibrancy, lasting power and comfortability on the lips. What do you think? Which of these is your favorite? What are your plans for Valentine’s Day? I’d love to know! Lastly, be sure to check out Lauren on her Insta or visit her blog!